The term phosphate refers to any one of a wide variety of chemical compounds that contain phosphorus, a naturally occurring mineral, bonded together with oxygen. The term is used both in inorganic chemistry and organic chemistry. In inorganic chemistry, the phosphate ion combines one phosphorus atom with 3 or 4 oxygen atoms, forming the base for many different salts. In organic chemistry, a phosphate is an ester, in which the hydrogen in the compound's carboxyl group is replaced with a hydrocarbon group. Phosphate molecules are usually found in combination with other elements, such as calcium, sodium, potassium, and aluminum. Naturally occurring inorganic phosphates are found in virtually every living thing, and synthetic phosphates are used in a wide variety of applications, including cleaning and baking products, as well as fertilizers. According to the Phosphate Forum of the Americas, phosphates fall into three major groups: orthophosphates, pyrophosphates, and polyphosphates, of which tripolyphosphates are one subgroup. The categories refer to the number of phosphate units that are linked together in the molecule. Orthophosphates are the simplest form of phosphate, and are sometimes called monophosphoric acids. In this form, three hydrogen atoms are bonded to the oxygen atoms in the phosphate structure. This simplest form of phosphate is very commonly used in detergents. Pyrophosphates, also sometimes called diphosphates, and they are sometimes considered one type of polyphosphate. Pyrophosphates were originally formed by heating phosphate compounds, which creates a form of phosphate with good solubility. Pyrophosphates are often used in food additives but are also found in household cleaners. Polyphosphates are any compounds in which two or more individual phosphate units share common oxygen atoms. One type, the tripolyphosphates, consist of three tetrahedral PO4 phosphate units linked together by sharing oxygen centers. Polyphosphates are also commonly found in household cleaners. Sodium tripolyphosphate (STPP): This form of phosphate is often used in automatic dish detergents and laundry uses. Tetrapotassium pyrophosphate (TKPP). This type of phosphate is used in specialty products, such as silver cleaners, detergents and cleaning products in liquid form for industrial applications. According to the U.S. Department of Health Human Services Household Products Database, this chemical also goes by the names potassium pyrophosphate, diphosphoric acid, tetrapotassium salt, and tetrapotassium pyrophosphate. Trisodium phosphates (TSP), Tetra-Sodium and Potassium Pyrophosphates, Sodium Potassium Pyrophosphate: These are the phosphates used in heavy-duty cleaning products. Phosphates are used in automatic dish detergents and laundry detergents to help soften water and to remove soil, oil, and grease. They also help prevent spotting and film build-up in automatic dish detergents. Due to their ability to cut through soap scum and mineral build-up, they are sometimes used in tile and porcelain cleaning products. In addition, phosphates may be used in specialty cleaners, such as concrete cleaners. In addition to cleaning products, phosphates have a dizzying number of other uses. They may be found in water-based paints and coatings, metal polishes, flame retardants, processed foods, personal care products, pharmaceutical products, and more. For example, STPP is used to preserve the moisture and flavor in shrimp and ham. Phosphates occur naturally in certain foods, but when added to processed foods they can have serious health effects if large amounts are consumed. Phosphate food additives have been shown to stimulate lung cancer development. High phosphate content in processed foods can also affect renal and cardiovascular function. When phosphates are used in cleaning products, they can also cause health problems. Housekeeping employees in New York medical establishments reported a reduction in symptoms, such as rashes, dizziness, and scratchy throats, once they started using phosphate-free cleaning products. In the environment, large amounts of phosphates flowing into water supplies enhance algae growth and reduce the oxygen available for fish and plants in streams and lakes. When phosphates are used in food, personal care, and pharmaceutical preparations, they are monitored by the U.S. Food and Drug Administration (FDA). For other uses, such as cleaning products, they are monitored by the Environmental Protection Agency (EPA). Phosphates have been banned for use in laundry detergents in the U.S. since the 1990s and may soon be banned in Europe, too. 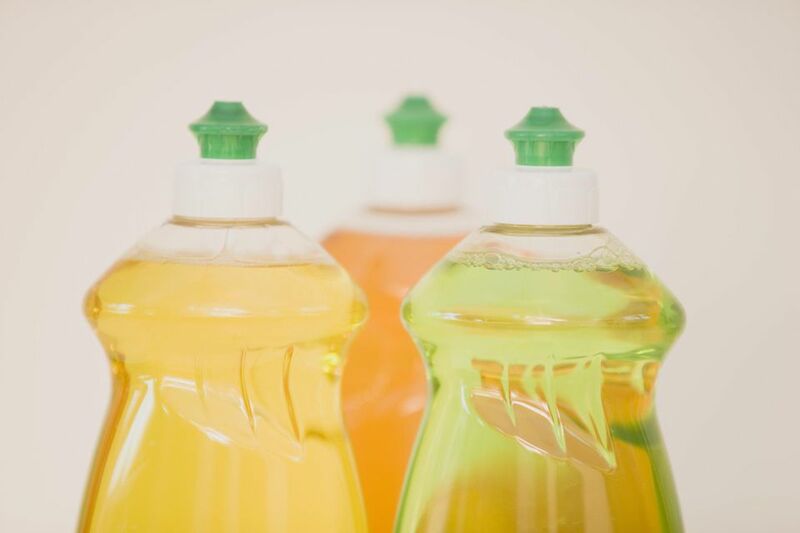 With regard to automatic dish detergents, phosphates have also been banned in several U.S. states, but are still allowed in institutional cleaning products. The Environmental Working Group's Skin Deep Cosmetic Database. Several manufacturers, such as Seventh Generation, have jumped on board with phosphate-free dish detergents. However, water-spotting on china and glassware can be a problem with these products. Instead of using products containing phosphates to remove scale and soap scum, try cleaning with vinegar or making your own vinegar spray.